Get an overview of what is currently happening within SupportDesk! SupportDesk’s Help Desk Timeline feature, allows users to view a social media-style, real-time newsfeed of what is currently happening on the helpdesk, as is appropriate to their role. System Supervisors can view a complete timeline of all happenings on the service desk. This can include if new tickets have been added and by who. If notes have been added to tickets, if new inventory items or customers have been created etc. System Analysts who may require a more stripped-back view of the service desk, can just see a Timeline of calls that are assigned to them, or to their team. The Timeline can appear as a widget on the home page (Today Page) of the service desk agent logging in, or even on the Customer web self service portal. The Timeline can be added to the home page using the drag and drop dashboard forms designer. 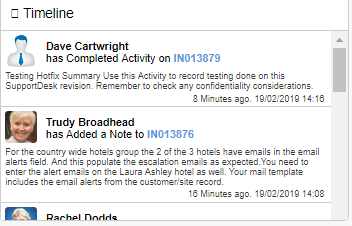 View chronologically in real-time the latest events happening on the service desk. View the summary of the Incident, Request, Note etc. in the Timeline. Drill-down links in the Timeline allow users to link directly to the ticket or note added. Restrict which users can view the Help Desk Timeline by configuring individual Service Desk Login privileges. Add profile pictures to logins so that you can see who has added what at a glance. Check out some of these SupportDesk Customer testimonials!